Almost let this one slip by and that would have been unfortunate! Cardinal Sin from Basilica Cardinale executed this lavish dress cassock very well. The flexi skirt portion has just the right stiffness to feel right to me. The textures and prim-work are terrific. I added a pair of Evocative Cuban Ankle boots for a nice dressy finish. The skin is LeLutka’s Absolute (Pale) and adds great mood to the piece. The hair is MADesign’s Marcus in dark brown. The outfit itself wasn’t all that, but I think what got the edge was the animation work. I added a “monk walk” so that when I went onto the stage, my hands folded into the sleeves of my cassock and I walked slowly with my head down. 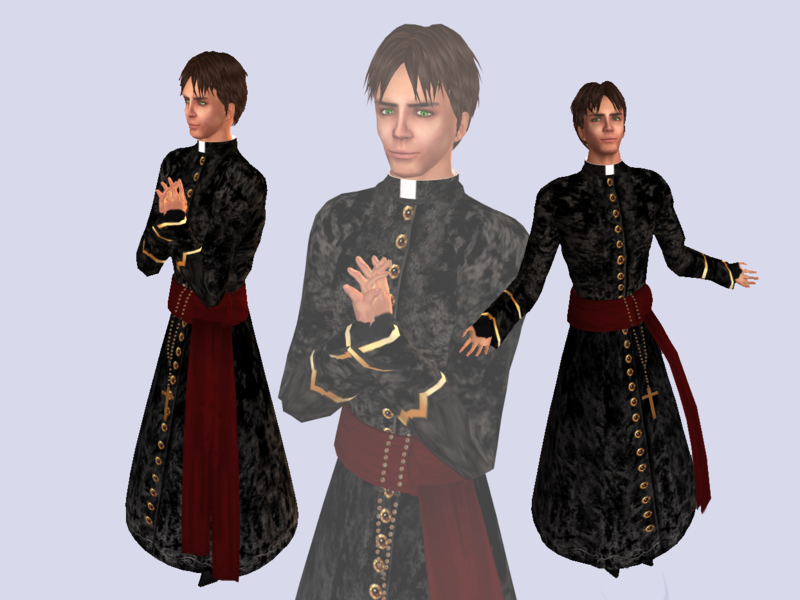 I added some specialized poses to my line up — including a prayer pose, a “receiving arms” pose, a genuflection, and a blessing. Those really helped sell the outfit, I think. I kept trying to find a crucifix to wear around my neck. They just didn’t sit right on the richly textured buttons because all the ones I have are too small in scale, or too dark to show against the black background. A nicely ornate golden crucifix might have helped. This was an “out of the box and walk” outfit. Cardinal Sin did a great job in putting the outfit together but it left little for me to do to “style” other than the addition of the animations. It might have been interesting to see how I might have done had I taken something like a simple alb and added some detail of my own. Then again, it’s hard to argue with first. Posted on June 10, 2009, in Contests. Bookmark the permalink. Leave a comment.